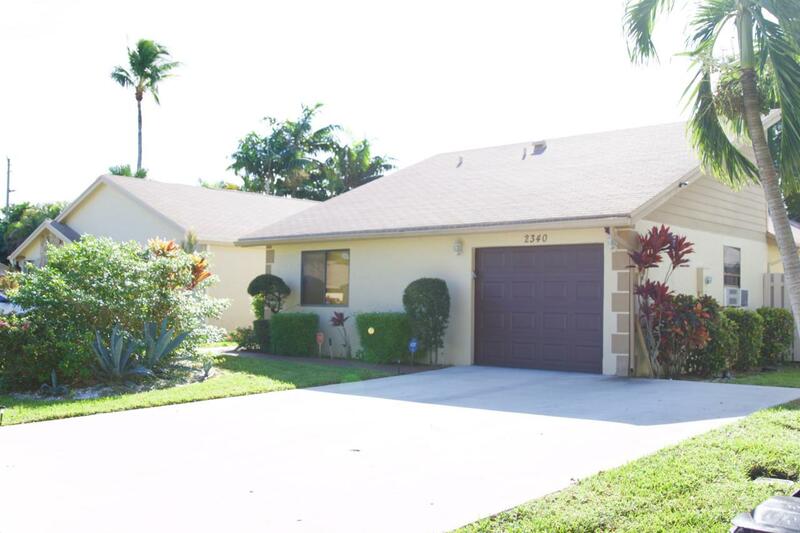 This beautiful single family home is turnkey, located in the highly desired Rainberry Bay, 55 plus community in Delray Beach. This home has a multitude of upgrades such as crown molding, updated bathrooms, laminate and tile flooring, French doors, granite kitchen counter tops, resurfaced kitchen cabinets, custom window treatments, as well as a newly installed private deck/seating area. This home is perfect distance from the theater as well as the pools. This unique home is 1,727 sq. ft. under air located on a beautiful tree lined street. The community has a 24 hour manned gate and is minutes away from downtown Atlantic Ave as well as the beach. The amenities include a Clubhouse, pools, tennis courts, theater and walking paths around the lake. This is a true gem and won't last long! Listing provided courtesy of Coldwell Banker/Delray Beach. © 2019 All rights reserved. All listings featuring the BMLS logo are provided by BeachesMLS Inc. This information is not verified for authenticity or accuracy and is not guaranteed. Copyright 2019 Beaches Multiple Listing Service, Inc. IDX information is provided exclusively for consumers' personal, non-commercial use and it may not be used for any purpose other than to identify prospective properties consumers may be interested in purchasing. Data last updated 2019-04-24T12:04:11.81. Listing information © 2019 Greater Fort Lauderdale REALTORS®, Inc. IDX information is provided exclusively for consumers' personal, non-commercial use and may not be used for any purpose other than to identify prospective properties consumers may be interested in purchasing. IDX data is deemed reliable but is not guaranteed accurate by the MLS or Weichert, Realtors® - True Quality Service. Data last updated: 2019-04-24T12:18:14.073.